Figured everyone might be tired of yoyo's, so here is another project I have going at the moment. OK! So like most crafters I like to junk (thrift shop). 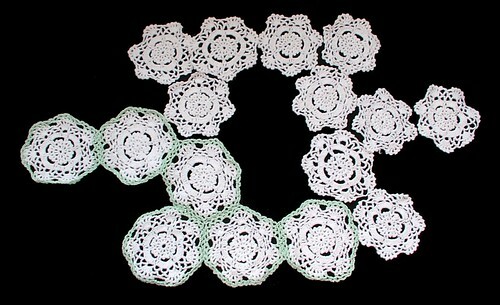 A while back I came upon 208 little doilies, some white, some ecru. Upon first glance they looked like little hexagons. 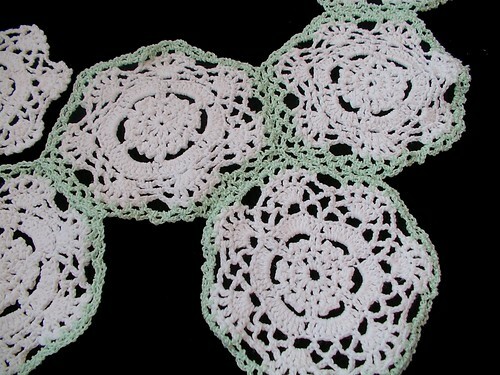 Obviously I only paid attention to the center rounds of the doilies because the center is six sided, but the outside has 7 sides. Now for all you math people out there who know that seven sided shapes, when attached together, do not fit as nice as hexs: yes, they make a spherical-like shape, not a flat surface. Original plan tossed aside, I thought I could make another hex skirt with a different patterned hex; no such luck. So now, what to do with all of these. I played with the layout for a bit and came up with the configuration in the photos, haven't decided yet if it is a collar for a little girl's summer nightgown or for a Sunday dress. So OK, 16 down once this is done; only 192 more to figure out. I am sure you will find something to do with all of them. Like around a curtain panel as a border. How about little ribbons on them to hang from a Christmas Tree. Maybe a CHristmas Tree for charity. Like putting up a tree on the ped ward of your near-by hospital next Christmas. Or at a rest home. Isnt it just crazy to think that someone actually crocheted 208 of them. I have not crocheted with cotton for years - always sticking to wool. 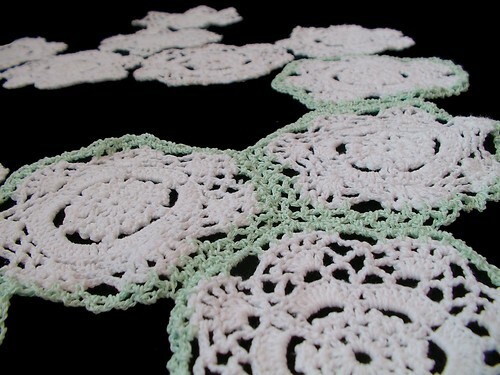 Years ago i dutifully made horrible doilies for some elderly family members. I think it traumatized me. But these look really good. What about stitching them individually onto cotton squares and then making them into a patchwork cushion cover? It is difficult to judge the scale of the doilies from the photos but if it is (big) enough you can make a tablecloth or a bedcover. Or what about a lace curtain? If you decide to use them as a neckline or yoke, I am waiting on pins and needles to see how you attach it! I have wonderful old patterns for tatted and crocheted nightgown yokes, but no one ever puts in good instructions for how to incorporate them into the final pieces! I bought a mile of handkerchief cotton to make nightgowns, but have yet to succesfully mate my crocheted yokes with the fabric! Who wants yoyo afghan pattern?